The essential parts of the plumbing system remain the same as described above, but each trap is considered to be siphon-able, and must be prevented from loosing its water-seal by the use of back-venting pipes. Whenever, then, there is an unusual amount of semi-vacuum created in the pipes by the discharge of some fixture above, the outside air-pressure can relieve it by passing through the back vents rather than by forcing out the water-seal in the traps. The usual type of trap employed is the modified S trap with the small TY connection to give what is known as continuous venting. Formerly the vent was taken off from the crown of the three-quarter-S trap, which was too near the surface of the water-seal, causing excessive evaporation and danger of clogging, but with the continuous system of venting, the waste-pipe is a continuation of the vent-line, and the trap enters into its side through a TY fitting, overcoming the disadvantage of the older system. The size of traps should conform to the size of waste-pipes, and usually the size of the branch vents is about the same size as the waste-lines. However, there are special conditions where this varies. For venting the water-closet trap, it should be noted that the vent is not taken from the trap which is contained within the fixture itself, but is taken from the upper side of the bend (usually of lead) where the fixture is joined with the piping system, and is 2 inches in diameter. Where there are two fixtures, such as the lavatory and the bathtub, with 1 1/2-inch branch vents coming from the traps, these may be joined into one main branch vent, which need not be more than 1 1/2 inches in diameter. The pitch of the branch vents entering into the main vent should be at an angle of about 45 degrees, so that all rust scale will drop down into the fixture outlet and be washed away. The main vent, which runs parallel with the main soil line, needs to be only 2 inches in diameter, and should be branched in at the bottom and the top to the main soil-line, as shown in the drawings. The material of which both main vent and branch vent is made should be galvanized-iron piping. 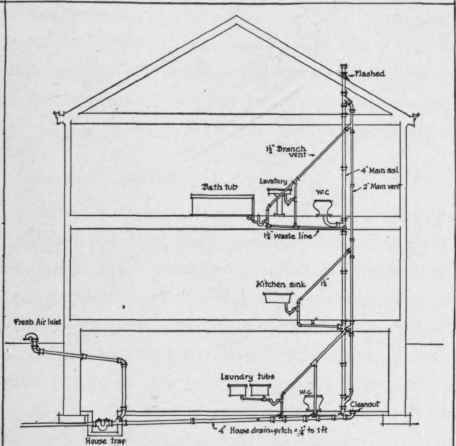 The fresh-air inlet, the house-trap, the clean-outs, and all other parts of the system are the same as was shown for the simpler method of plumbing.